Litecoin price failed to stay above the $134 support and declined against the US Dollar. 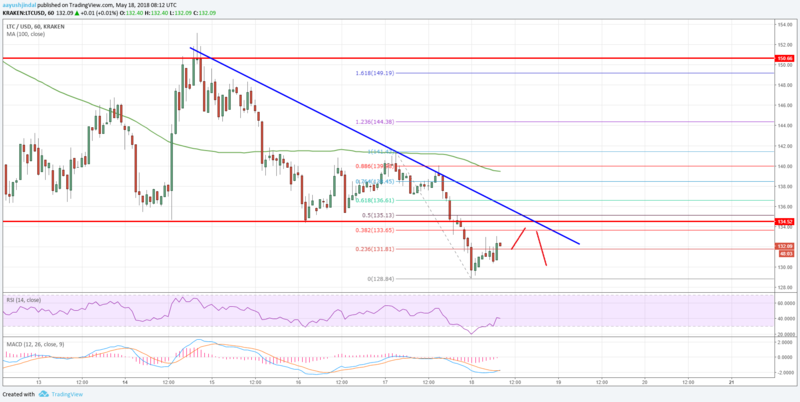 LTC/USD traded towards $128 and is currently correcting higher. Litecoin price faced an increased selling pressure and declined below the $135 support (Data feed of Kraken) against the US Dollar. There is a crucial bearish trend line forming with resistance at $134.50 on the hourly chart of the LTC/USD pair. The pair is currently correcting higher, but the previous support near $135 may act as a resistance. There was no upside break above $142 in litecoin price against the US dollar. The LTC/USD pair faced an increased selling pressure around $140-142, which resulted in a sharp downside move. Looking at the chart, the failed to move above $142 and the 100 hourly simple moving average. It dropped and moved below the $135, $134 and $130 levels. It traded close to the $128 level and a low was formed at $128.84. Later, the price started consolidating around $128 and it moved above the 23.6% Fib retracement level of the last drop from the $141.42 high to $128.84 low. However, there are many hurdles on the upside near $135. The stated $135 level was a support earlier and now it may well stop gains. There is also a crucial bearish trend line forming with resistance at $134.50 on the hourly chart of the LTC/USD pair. Moreover, the 50% Fib retracement level of the last drop from the $141.42 high to $128.84 low is at $135.13, which is another major resistance. Therefore, if the price moves higher, it will most likely face a strong resistance near the $135 level. Should there be an upside break above $135, the price may move towards the $142 resistance and the 100 hourly SMA. On the downside, the recent low of $128.84 is a short term support. The next major support on the downside sits around the $120 level, which is likely to prevent further declines.